358 million. That's how many dollars were collected with checkout programs in 2012. Checkout programs are what I call point-of-sale programs, but I kind of like David Hessekiel's term better. As founder and president of Cause Marketing Forum, he's the one who released a study on these programs at last week's Cause Marketing Forum's conference in Chicago. These programs are so successful, David only focused on programs that raised a million dollars or more. He found 63 of them. You can read the full report here, and it really is worth the read. Here's what businesses and nonprofits need to know about checkout programs. These programs really work. And when I mean work they can raise a lot of money. The proof is in these 63 programs. But think of all the programs that raise less than a million. 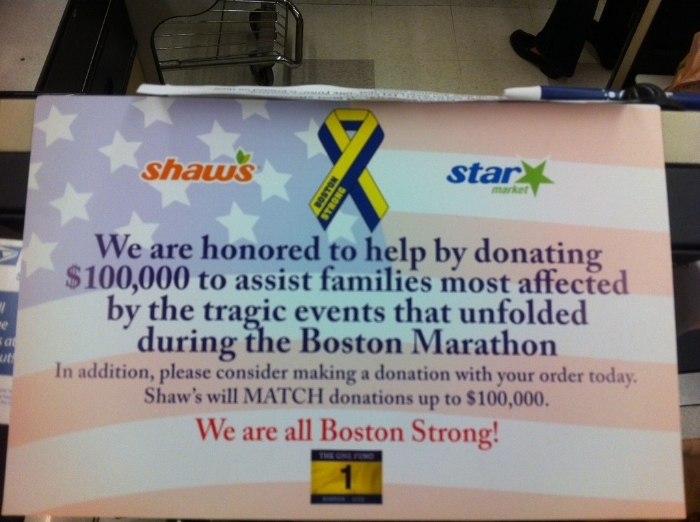 As a local cause marketer here in Boston, I never raised more than $300,000 with a checkout program. Add these smaller programs in and you're talking tens of millions of dollars more raised with checkout programs. Emotion wins at the register. Maybe that's why 47 percent of the dollars raised went to children's causes, such as Children's Miracle Network and St. Jude Children's Research Hospital. You only have a second or two to win over customers with your ask, lead with a strong emotional message. Businesses with lots of foot traffic, locations do best. Most of the dollars raised from checkout programs come from chains of department stores, restaurants and supermarkets. David's report features big companies like Walmart and Sam's Club, but chains of any size are good candidates. You just need to be realistic on how much you will raise when a chain has six or sixty locations instead of 600 or 6,000! Checkout programs can take several forms. Pinups, register programs, donation boxes and round-up programs. You can find examples of all of these on this blog and on my Pinterest boards. Incentives work at checkout. Coupons, discounts and free items are always popular with consumers. But don't forget incentives for employees. Small thank yous from t-shirts to pizza parties to gift cards will keep employees asking that all-important question: "Would you like to donate a dollar to ___________?". Checkout programs need company. I've concluded after many years of running checkout programs that businesses asking consumers for money at checkout isn't enough. I've made the argument elsewhere that it is, but ultimately it doesn't pass the smell test with consumers. Companies need to combine asking with giving. That means dipping into their own pockets to support their favorite causes AND tapping their customer base for gifts. What are your favorite checkout programs? I'm always looking for good local programs to write about! With a new dog in the house, I've been shopping for a few items at my local Petco, which is just a couple miles from where I live. After I swiped my credit card in the terminal, I got the below message from the Petco Foundation. Now, I've seen many requests for a donation on credit card terminals, but I haven't seen one yet that makes me choose YES or NO like this one does. The ask is very clear and you have to choose a response to continue with checkout. I love the idea of using credit card terminals to process donations. I hate all the clutter and paper waste from pinups. But there's one problem. 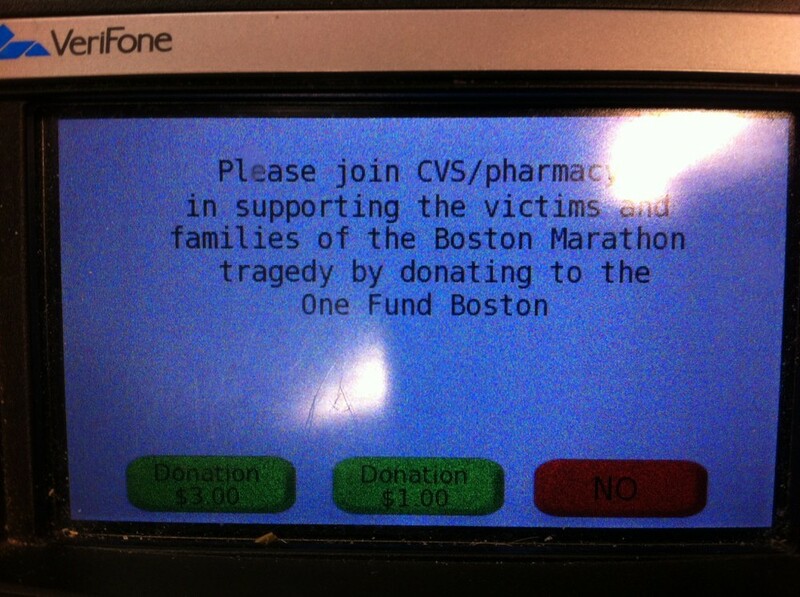 The credit card terminal gives the cashier a reason NOT to ask the shopper to donate. They figure the terminal will do the work. But it doesn't. Without a direct ask, the shopper can quickly bypass the donation request and move on with their transaction. 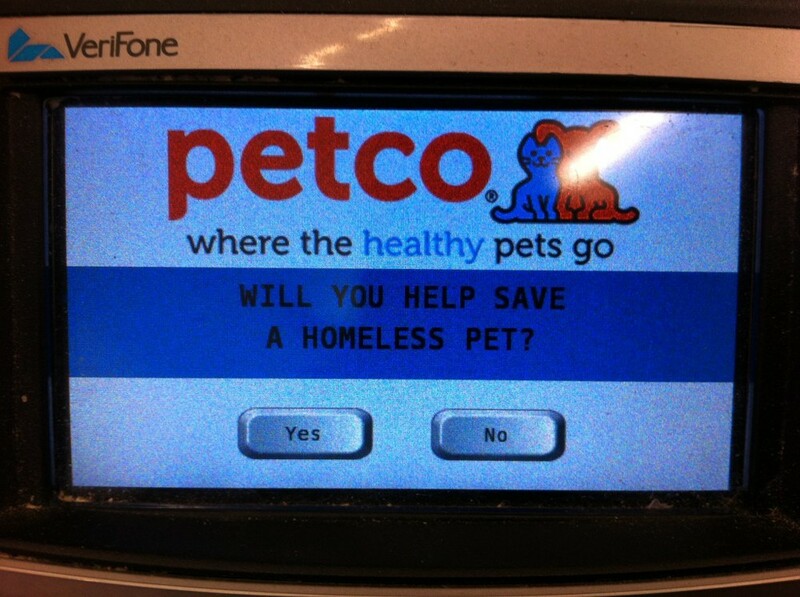 But at Petco the first thing they ask you after you swipe your card is if you want to give. They force you to choose, which makes it more difficult to say no. Maybe that's why the Petco Foundation gave away $15 million last year. Whether it's a pinup or a credit card machine, the bottom-line is that the best register programs involve an ask from the cashier. It's harder to say no to a human being. It's easier to say no to a screen, but at least this screen makes you say it to its face. What do you think about requests for donations on a credit card terminal? Yes or no? Paper Pinups vs Credit Card Machines: Which One Raises More Money? People always ask me if there's a good alternative to traditional paper pinups. The answer is maybe. My friend and fellow cause marketer Scott Henderson sent me this picture of a register program at Radio Shack that prompts shoppers to support LIVESTRONG after they've swiped their credit card. I prefer the credit card machine because there is no paper waste from the pinups, which will all end up in the trash after the program is done. There's one problem: promotions involving credit card machines may not be as effective and lucrative as paper pinups. My former colleague Holt Murray and I discussed this on Twitter. First, if there is no activation from the cashier (i.e. "Would you like to donate a dollar to fight cancer?") nothing will happen. But this is true with paper pinups as well. No ask, no gift. Second, the credit card machine is not a place where shoppers want to linger. As Holt points out, he just wants to get through the transaction as quickly as possible. Third, the credit card machine just seems a lot easier to opt-out of. One thing that's great about pinups is people have to acknowledge to the cashier - and everyone around them - that "Yes, I will donate a dollar." That's not the case with the credit card machine. It's interesting what people do when no one is looking. However, there are almost as many good reasons to use the credit card machine. You'll save money not printing pinups. Ann Taylor, CVS, Auto Zone and Williams-Sonoma raise millions for charities with credit card machine programs. But these programs happen at thousands of stores and the volume of foot traffic work in the charity's favor. Credit card machines are also great for businesses that don't want to display pinups in the store. But if you're doing a local program with a retailer you may want to test to see which one performs better. Half the stores could do pinups, the other half credit card machines. It's definitely easier to swipe and donate, but it may be even easier to swipe and NOT donate. That's one sale you don't want to miss. Have you used paper pinups and credit card machines? Which one has worked better for you?